The Banaue Rice Terraces (Hagdan-hagdang Palayan ng Banaue), 2000 year old terraces, had been carved into the mountains of Ifugao in the Philippines by ancestors of the Batad indigenous people. The Banaue terraces constitute part of the Rice Terraces of the Philippine Cordilleras, ancient sprawling human-made structures from 2,000 to 6,000 years old. Found in the provinces of Apayao, Benguet, Mountain Province, and Ifugao, UNESCO has declared the terraces a World Heritage Site. Ifugao, a landlocked province of the Philippines in the Cordillera Administrative Region in Luzon, covers a total land area of 251,778 hectares. The province of Ifugao, a mountainous region characterized by rugged terrain, river valleys, and massive forests, has its capital in Lagawe. It borders Benguet to the west, Mountain Province to the north, Isabela to the east, and Nueva Vizcaya to the south. The rice culture of the Ifugao people requires tremendous skill and knowledge that has been passed on from generation to generation. Recent challenges, including a devastating earthquake in 1990 that damaged the terraces, and recent El Niños that have spawned droughts and crop-threatening worms, have threatened the continued existence of the Banaue rice terraces. Farming the terraces has become less and less attractive to the new generation of Ifugao people. They had already been suffering from low returns on their labor in light of the slow growth of terrace rice in the cool climate. The Banaue Rice Terraces have been intricately woven in the culture and life of the 20,000 Ifugao people who cultivate them. Their festivals and holy days revolve around the cultivation and harvesting of rice from the terraces. Without the dedication of the Ifugao people, the rice terraces of Banaue would not exist. Without the Banaue Rice Terraces, the Ifugao people would cease to exist. The terraces and the people have a symbiotic relationship. Banaue, a fourth class municipality in the province of Ifugao, Philippines, has a population of 20,563 people in 3,952 households according to the 2000 census. The Banaue Rice Terraces have earned the region renown. Commonly referred to as the "Eighth Wonder of the World," the Rice Terraces had been built largely by hand, with hand tools and animal power. Located approximately 1500 meters (5000 ft) above sea level and cover 10,360 square kilometers (about 4000 square miles) of mountainside, the terraces receive water through an ancient irrigation system from the rainforests above. The Banaue Rice Terraces begin at the base of the mountain range and extend several thousand feet upward. Their length, if put end to end, would encircle half of the globe. Built 2,000 years ago, the rice terraces manifest the engineering skill and ingenuity of the sturdy Ifugaos people. They have irrigated the terraces by means of mountain streams and springs tapped and channeled into canals that run downhill through the rice terraces. The rice terraces once stretched northeast to Cagayan and as far south as Quezon. Slowly farmers have been abandoning them and they show signs of deterioration. A severe 1990 earthquake damaged some of the terraces' irrigation systems, while El Niño triggered droughts that led giant earthworms to erode the terraces' soil. Furthermore, the rice variety most suited to the area's cool climate has a low yield, taking months to mature. Some Ifugao families have abandoned their land in the rice terraces in favor of land that reaps faster rewards. A traditional house in Ifugao. Ifugao refers to the people, their dialect and the province they live in the mountainous northern part of the Philippines. Known as an independent, agricultural society, they speak various Ifugao dialects, such as Tuwali and Ayangan. They speak Filipino vernacular dialects like Ilokano and Tagalog as well. Many Ifugaos, especially in Lagawe, Kiangan, Mayoyao, Aguinaldo, and Banaue, speak English fluently as well. They prefer the name Ifugaos as opposed to the more generic and less accurate Igorot term that includes all the peoples of the Cordillera Region, which specifically refers to some of the inhabitants of Benguet. Ifugao culture revolves around rice, considered a prestige crop. They culture displays an elaborate and complex array of rice culture feasts inextricably linked with taboos and intricate agricultural rites from rice cultivation to rice consumption. Harvest season certainly calls for grandiose thanksgiving feasts while the concluding harvest rites tungo or tungul (the day of rest) entail a strict taboo of any agricultural work. Partaking of the rice beer (bayah), rice cakes, and betel nut constitutes an indelible practice during the festivities and ritual activities. Rice in Ifugao ready to be harvested. Rightly known as the unrivaled rice terrace builders, the Ifugao people practice swidden farming expending most of their energy working at their terraces and forest lands while occasionally tending to swidden/shifting root crop cultivation as a complementary form of agriculture. 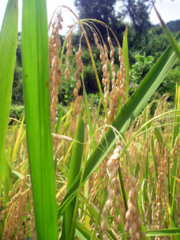 That diversification in agriculture, of rice growing while cultivating indigenous edible shells, fruit trees, and root crops, has been exhibited among Ifugaos for generations, reflecting their awareness in diversified but sustainable farming. Even the building of the rice terraces, a painstaking and backbreaking work of blanketing walls with stones and earth and effectively drawing water from a main irrigation canal above the terrace clusters, clearly manifests the importance Ifugao people put on their rice terraces. Indigenous rice terracing technologies have been identified with the Ifugao rice terraces such as their hydraulic knowledge (use of water as a construction tool), stonework and earthwork (the knowledge of utilizing various types of soil and rocks to form stable terrace walls). They include, as well, terrace design (maximizing the terrace area and building them into an agriculturally-productive area) and lastly, terrace maintenance (traditional irrigation and drainage management systems). As their source of life and art, the rice terraces have sustained and shaped the lives of the community members. Fabrics weaved by an Ifugao native. Ifugao, formerly belonging to the old Mountain Province, had been created as an independent province on June 18, 1966 by virtue of Republic Act No. 4695. The name derives from the word “IPUGO.” Pugo means “hill” while the prefix “I” means “from.” The Spaniards changed "Ipugo" to "Ipugaw," finally changed by the Americans to Ifugao. For the Ifugaos, custom serves as the basis of all laws. But those customs would mean nothing without a knowledge of their ancestry. Among the Ifugaos, extensive pedigrees exist. This graphic representation gives evidence of a basic principle of the Ifugao culture: "We cannot but do what our ancestors told us." Ifugao became the center of warfare during the last stages of World War II. General Yamashita, the known "Tiger of Malaya," decided to put his last stand against the Filipino and American forces in Ifugao, particularly in Mt. Napulawan. He informally surrendered to Captain Grisham of the 6th U.S. Army in the Philippines, based in Kiangan, Ifugao, before flying to Camp John Hay where he formally surrendered. Abstract pattern of terrace rice fields in Yunnan Province, southern China. In agriculture, a terrace refers to a leveled section of a hilly cultivated area, designed as a method of soil conservation to slow or prevent the rapid surface runoff of irrigation water. Often such land forms into multiple terraces, giving a stepped appearance. The human landscapes of rice cultivation in terraces that follow the natural contours of the escarpments like contour plowing display a classic feature of the island of Bali and the Banaue Rice Terraces in Benguet, Philippines. In Peru, the Inca made use of otherwise unusable slopes by drystone walling to create terraces. That form of land use has been prevalent in many countries, used for crops requiring a lot of water, such as rice. Terraces proved easier for both mechanical and manual sowing and harvesting than a steep slope would be. Natural terracing, the result of small-scale erosion, forms where cattle graze for long periods on steep sloping pasture. Sometimes, as a Glastonbury Tor, the regular result gives an impression of archaeological artifacts. From its origins in agriculture, the practice of formally terracing a sloping site evolved in gardening. The Hanging Gardens of Babylon could have been built on an artificial mountain with stepped terraces like those on a ziggurat. At the seaside Villa of the Papyri in Herculaneum, the villa gardens of Julius Caesar's father-in-law fell away giving pleasant and varied views of the Bay of Naples. The Inca used some farming terrace methods for soil conservation. They used a system of canals and aqueducts, and made the water flow through dry land and helped them be fertile lands. The Incas constructed the terraces on the slopes of the Andes mountains. They cut step-like ledges into the mountainside, so they could be used as field, where they planted crops. Using terraces also stopped the rain from washing away the soil. That technique proved so successful that farmers still work the land that way in the Andes Mountains. In old English, a terrace had been called a lynch, a fine example of a Lynch Mill existing in Lyme Regis. In Lyme Regis, the water arrives via a river ducted along a terrace. That set-up had been used in steeply hilly areas in the UK. Beyer, Otley. 1955. The Origin and History of the Philippine Rice Terraces. Quezon City: National Research Council of the Philippines, University of The Philippines. Medina, Susan Calo. 1989. Terraces of Banaue. Los Angeles: Philippine Expressions. Medina, Carlos R. 2003. Understanding the Ifugao Rice Terraces. Baguio City, Philippines: Saint Louis University, Cordillera Research and Development Foundation. Wackernagel, Frederick W. 1985. Rice for the Terraces: Cold-Tolerant Varieties and Other Strategies for Increasing Rice Production in the Mountains of Southeast Asia. Thesis (Ph. D.)—Cornell University, Jan., 1985. World Heritage Sites and Schlessinger Media. 2005. Vietnam & the Philippines. Wonders of the Asian World. Wynnewood, Penn: Schlessinger Media. ISBN 9781417103423. UNESCO World Heritage Site Link. More photos and information on Banaue, Ifugao. History of "Banaue Rice Terraces"
This page was last modified on 11 May 2016, at 14:21.